The total volume of ocean floor production becomes increasingly difficult to constrain as we work backwards in time. Ocean floor is increasingly lost to subduction, and efforts to replicate the missing parts become speculation. The continents, by contrast, have grown steadily through time. 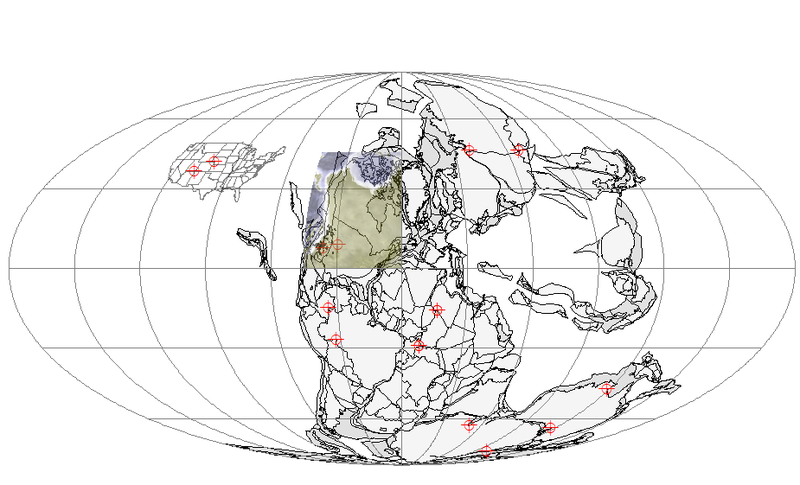 Stable parts of continents exist that have seen little or no deformation at Phanerozoic scale. The uncertainties of continental movement derive from remagnetization, inclination, and true polar wander; which can confound Euler rotations. These uncertainties should not be ignored. Nevertheless, there is general agreement since the beginning of the Mesozoic era on the positions of the major cratons. 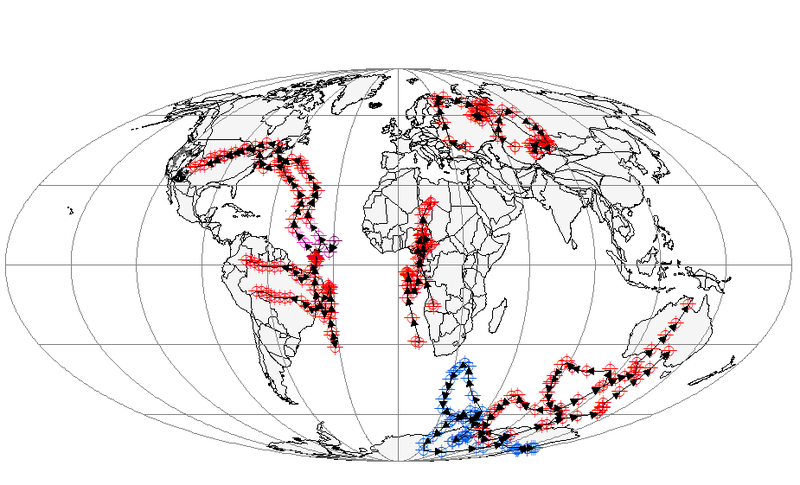 The positions of continents abutting the Atlantic ridge system are well constrained by existing ocean floor. The positions and velocities of continents can be shown as vectors which represent the net effects of the forces exerted on them. These forces could be pushing from well-connected adjacent ocean floor, pushing from less connected adjacent subduction, shear, collision with other continental masses, and possibly from unknown forces acting on the deep roots of cratons that extend below the Mojo discontinuity. In 2014 we obtained the ArcMap data from Christopher Scotese’s Paleomap Project. Using the Point Tracker utility, we projected the southwest and northeast corners of the State of Colorado back to 250mya. We used these and other anchor points to project existing western US surface geology back as well. The view above at 160mya shows how this worked, and provided a wander path for North America. 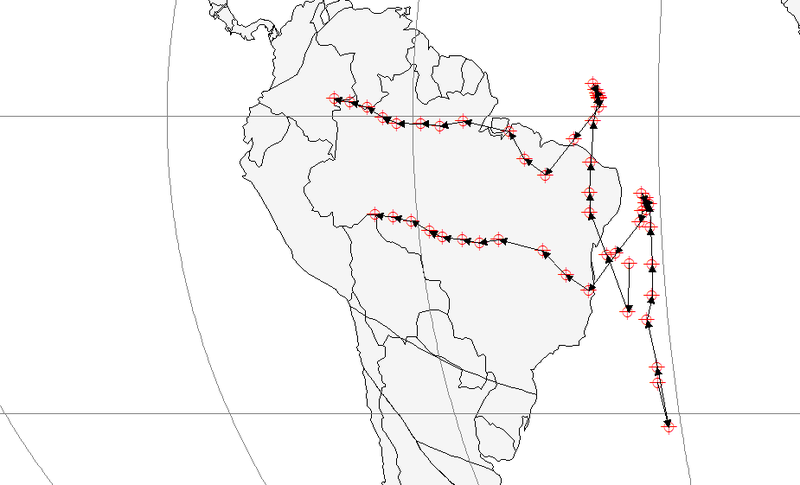 In the current study we extend the wander paths of stable points on the major cratons of Eurasia, South America, Africa, Antarctica, and Australia in the hope that these paths can help constrain the forces exerted on these continents. The image above shows the points chosen to begin with at 250mya. Also shown are projected rasters from Ron Blakey showing substantial agreement. Above are the evolved wander paths on today’s globe. Quite a spectacle. It can be seen from point clustering that there are variations in spreading rate with time. Using the coordinates, individual continental motion rates can be calculated. As can be seen above, the individual motions are quite a mess. 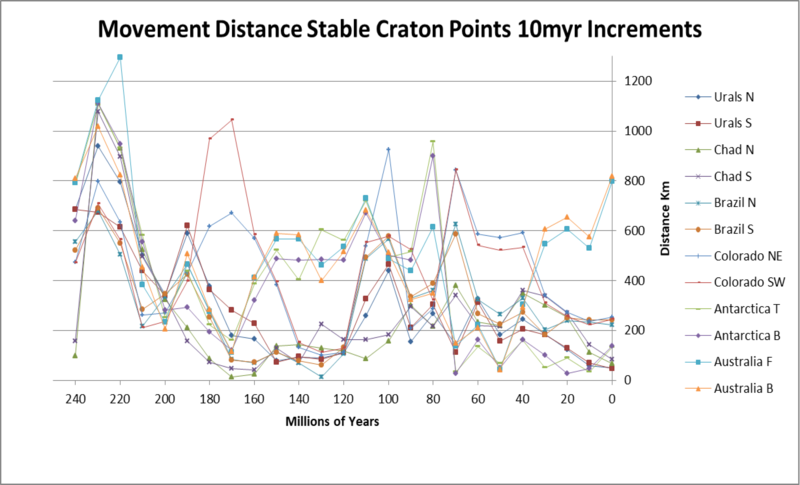 There is general agreement on a spike in motion ~230mya, a slowing in the 170 to 120 time frame, an increase during the Cretaceous superchron time frame, and (with the notable exception of Australia) a decrease to the present. The above shows the total measured movements over the period. 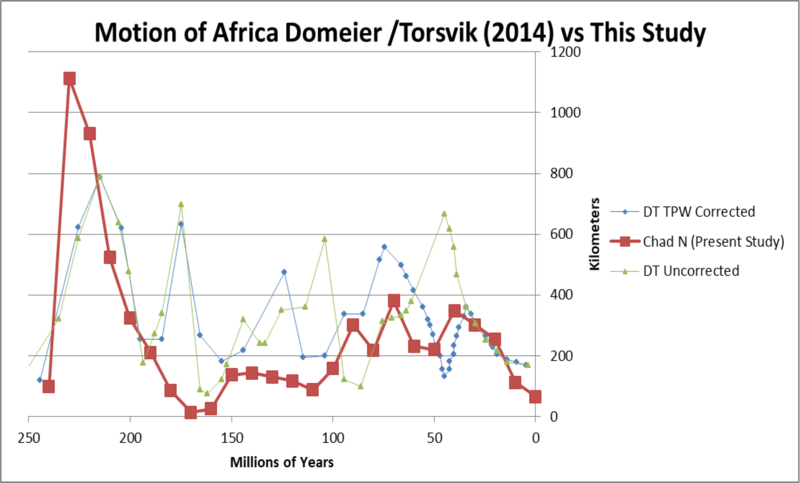 Using GPlates software and some different assumptions based on true polar wander and geological interpretations, Domeier and Torsvik (2014) produced a graphic of the motion of Africa from the late Paleozoic, the time focus of their paper. The points used to derive their vectors were not specified. The blue and green curves above are the true polar wander corrected and not corrected rates after Domeier and Torsvik, respectively, for the period we consider here. The red curve is northern Chad from this study. 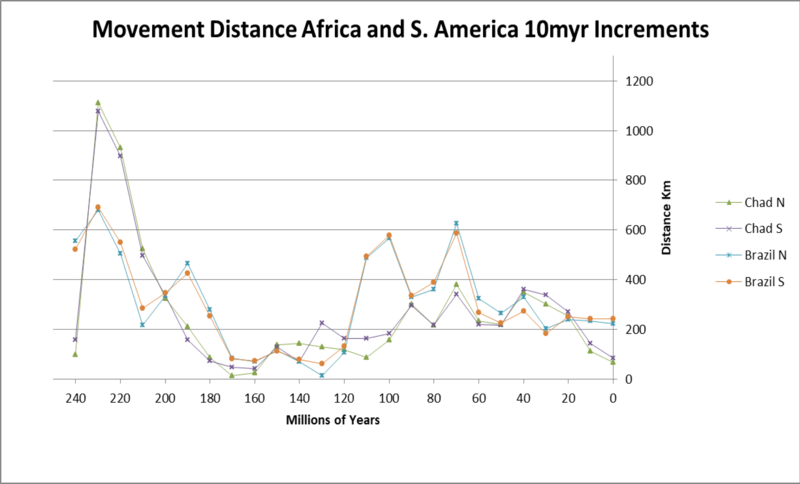 It is worth noting that according to this study, Africa’s motion has been principally meridional. 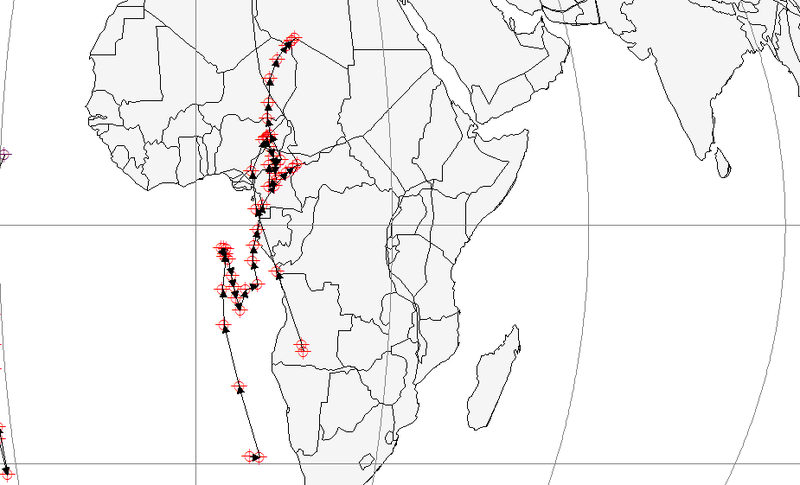 Africa’s motion was very rapid NNW from 240 to 200mya, followed by a hundred million years of hesitation and slow backtracking; before assuming an arcuate NNE path at moderate speed to its present location. This trajectory is unique in several respects, perhaps making Africa not the best choice for a general plate motion proxy. South America was ostensibly welded to Africa until its separation. It therefore shares similar paths with Africa through the “great hesitation”, but South America hesitated somewhat later, and rather than backtrack, it began separating to the SW. Above are the motion rates for Africa and South America. The two continents are geographically “keyed” together such that differential motion that does not result in separation would result in shear and compression for which there is no evidence. 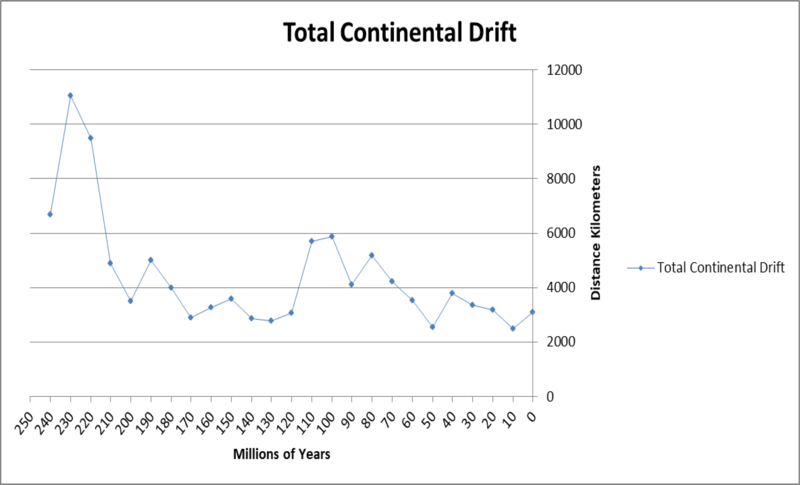 We conclude that the early more rapid northward movement of Africa resulted in a separation zone, perhaps a rift valley, that accommodated subsequent differential motion long before the Atlantic ridge began their official separation. In the next post, we will examine another austral continental pair: Australia and Antarctica. This entry was posted in Continental Wander Path, Paleogeography. Bookmark the permalink.